Hong Kong has been long recognised as a leading global city when it comes to fixed broadband performance. Unlike many other leading broadband markets, this has occurred without any financial support from the Hong Kong government. The removal, rather than an increase, of regulation of the privately-owned broadband network operators has been the overwhelming main driver of this outcome. The key factors driving this outcome have been an open market with low barriers to entry, aggressive competition between network operators, low network build costs and innovative marketing to stimulate demand for higher-speed broadband service. The successful rollout of profitable competing Fibre to the Premises (FTTP) across the city demonstrates that fibre networks are not always and everywhere utility-style natural monopolies. However, the lack of a universal service obligation for broadband does also mean that in areas where competition is neither technically nor economically feasible approximately 10% to 15% of Hong Kong households are not benefiting from this policy. Hong Kong has consistently been a top performer in the global rankings for broadband download speeds. According to Akamai?s State of the Internet report (Akamai, 2017) for Q1 2017, Hong Kong was ranked 4th globally with an Average Peak Connection Speed of 129.5 Mbps. This ranking has been consistent for over five years, with Hong Kong ranking alongside the other top performers such as Singapore and South Korea. On the broader measure of overall Average Connection Speed, which is impacted by factors other than the local access connection, the average speed in Hong Kong is 21.9Mbps, again with a ranking of 4th globally behind South Korea, Norway and Sweden. Hong Kong is the only market ranking in the top four globally for both of these measures. These high rankings are consistent with the wide deployment of optical fibre infrastructure in the access network of these countries. The deployment of deep fibre optical fibre networks in these countries have enabled peak download speeds of up to 1 Gbps for residential users. However, Hong Kong is unique in that this investment has not resulted from an active government policy framework: rather it has resulted from the withdrawal of government from regulation of the telecommunications sector. While other markets have had pro-active government policies and investments to encourage higher speed broadband (eg. Singapore, South Korea), Hong Kong is distinguishable by the almost complete lack of government support provided to the telecommunications sector. This paper examines the factors that have enabled Hong Kong to achieve this outcome. The Hong Kong telecommunications market, like many other markets, was originally dominated by an incumbent monopoly provider of the telephony network, namely the Hong Kong Telephone Company (HKTC), which was acquired by Cable & Wireless in 1984. In 1995, the Hong Kong local fixed market was partly liberalised by the granting of three additional Fixed Telecommunication Network Services (FTNS) licences which allowed new companies to build and operate full-service fixed networks with separate outside cable plant and exchange-based facilities. The three new additional operators were New T&T (subsequently Wharf T&T), Hutchison and New World. From 1995 to 2003, these four operators focussed on building optical fibre networks throughout Hong Kong for the connection of enterprise and wholesale customers. Some sharing of network build activity was achieved (ie. sharing of trenches, ducts etc) however, the majority of the optical fibre networks involved separate cable plant and exchange facilities. Investment was driven by competition in the enterprise market between these four operators. This focus on optical fibre build out for enterprise market services was similar to many other large cities after the removal of monopoly protection for the incumbent telecommunications operator. Residential broadband services were launched in Hong Kong during the early 2000s, a similar timeframe to other markets. By the end of 2002, Hong Kong ranked second out of some of the global market leaders with takeup rates at 42% of Hong Kong households. Three technologies were used during this initial residential deployment phase. Firstly, ADSL over existing copper telephone cabling was used by PCCW-HKT to provide services from its network of telephone exchanges. Competition was facilitated by unbundled local loop (ULL) regulations that required PCCW-HKT to lease exchange-based copper loops to other licensed operators and for in-building sub-loops between all licensed operators (as some new operators were owners of in-building sub-loops via their real estate interests). Secondly, using DOCSIS on existing cable TV infrastructure, Hong Kong Cable Television (HKCTV) was able to provide broadband services after being granted a telecommunication licence in 2000. Lastly, using Ethernet over newly-installed Category-5 cabling (normally used in enterprise networks) by Hong Kong Broadband Network (HKBN), which had been granted a fixed wireless licence in 1999. HKBN was a 100% owned subsidiary of City Telecom which had commenced business in Hong Kong in 1992 by providing international calling card services. HKBN initially used a combination of Local Multipoint Distribution Services (LMDS), wireless backhaul and leased lines to connect residential households to its core network infrastructure with the in-building Ethernet cabling before deploying its own fibre from 2002 after being granted a full FTNS licence. By the end of 2002 HKBN had installed its own Ethernet in over 3000 residential apartment buildings covering approximately 30% of Hong Kong?s households, (OFTA, 2003a) covering over 1,000,000 households. In 2003, most of the restrictions on licensing of new fixed operators were removed in order to fully liberalise the Hong Kong fixed telecommunications market. Immediately after full liberalisation of the market in 2003, the Hong Kong regulator for telecommunications (Office of the Telecommunications Authority or OFTA) commenced a review of the ULL regime. The review was framed in terms of the overall policy objective of ?promoting an environment conducive to investment in network and facilitating effective facilities-based competition? (OFTA, 2003a). This review was occurring eight years after the initial opening up of the market and the corresponding investments by the four new entrants (including HKBN) and the incumbent cable TV provider. The question at issue was whether further regulation was needed to facilitate competition in the broadband market or whether continuing regulation of the market would actually hinder investment and hence restrict competition outcomes. 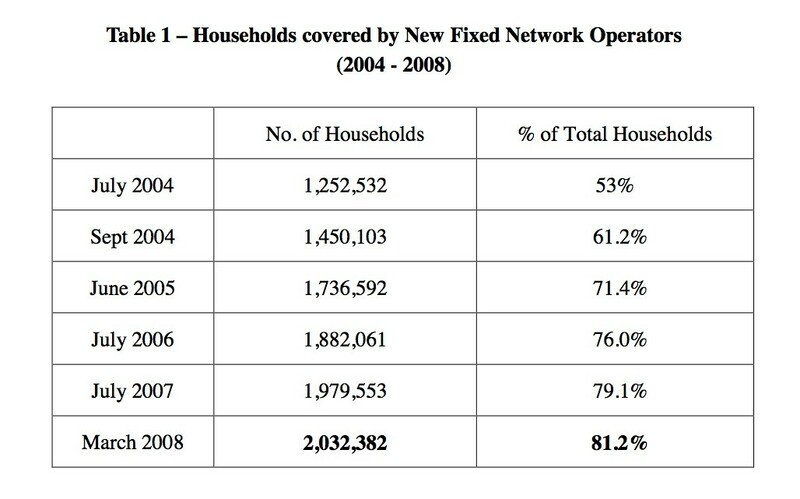 At the time of the review concluding, in July 2004, approximately 53% of Hong Kong households already accessed one or more alternative self-built customer access networks (from Hutchison, Wharf, NWT or HKBN). (OFTA, 2004). The technology deployed in these alternative access networks was primarily xDSL using existing building copper plant or new Ethernet Cat-5 cabling. Fibre infrastructure was built to the common telecoms equipment rooms of apartment buildings and not to each individual apartment (i.e. a Fibre to the Building architecture). This large build of alternative customer access networks in parallel with the regulated ULL regime was a positive sign that an investment appetite existed in the Hong Kong market. The regulator was keen to keep this momentum going. The responses of the five competitors to PCCW-HKT was crucial in determining whether there was sufficient appetite for investment in new network infrastructure existed. As can be seen from the above table there was a split between the ?pro-investment? and the ?pro-regulation? cases. Interestingly, both the largest and the smallest competitors to PCCW-HKT were aligned, pushing for infrastructure competition. The companies that had benefited in the enterprise market by infrastructure competition (New World and Wharf) since 1995, but were not actively pursuing residential market share, were pro-regulation. The cable TV infrastructure player was undecided, mainly due to technology concerns regarding possible access to its hybrid fibre coax plants under the regulatory scheme at the time. Given a strong response from the largest and smallest competitor to PCCW-HKT to pursue a ?pro-investment? withdrawal of the ULL, the regulator decided to move in this direction on an apartment building-by-building basis. The key determinant for each building would be the existence of at least one competitive self-built fixed access infrastructure network capable of telephony and broadband services in addition to the incumbent copper network of PCCW-HKT. HKCTV?s cable TV network, however, was deemed not to be a self-built network for the purposes of this building classification for two reasons. Firstly, the lack of a ?conventional? telephony service, secondly the limited bandwidth of HFC services compared to fibre-based services and thirdly the lack of wholesale service on the HFC network were the reasons stated. The regulator was looking to promote fibre-based infrastructure competition ? not competition between HFC and DSL networks. A transitional period of two years was also put in place to ensure ULL based operators had the option of investing, but with an overall sunset data of 30 June 2008 (ie. four years after announcement of the withdrawal). This ?pro investment? regulatory decision by the regulator, knowing that it had strong signals of investment by both a new entrant (HKBN) and an established operator (Hutchison), was the key to Hong Kong?s successful rollout of competing fibre-based networks. From 2004 to 2008 the regulator managed the transition from ULL regulation to self-build customer access network rollout by providing regular information to consumers and industry on a building-by-building basis. A key factor in the successful transition from a ULL competition regime to infrastructure competition was the entry of an aggressive, disruptive competitor ? namely HKBN. In 2005, HKBN launched 1000Mbps (or 1Gbps) symmetric services using its Ethernet-based Category-5 Fibre to the Building (FTTB) network. This service was initially available to one-third of Hong Kong?s households. The push to higher speeds (ie. 100Mbps and 1Gbps) using Ethernet technology was a key differentiator against the xDSL-based incumbent and other competitors. By focussing exclusively on Ethernet and VoIP telephony services (rather than legacy xDSL and PSTN) HKBN was able to minimise costs and price aggressively to grow market share. 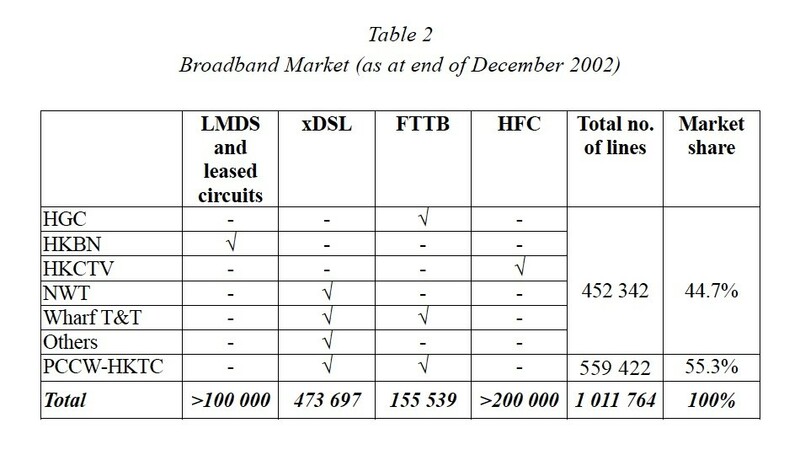 In 2008, HKBN reported broadband connections of 316,000 (City Telecom, 2011). This compared with HKCTV?s (now called i-Cable) reporting broadband connections of 280,000 (Telegeography, 2008) and Hutchison reporting 161,000 residential broadband connections for 2008 (Hutchison Telecom, 2009). 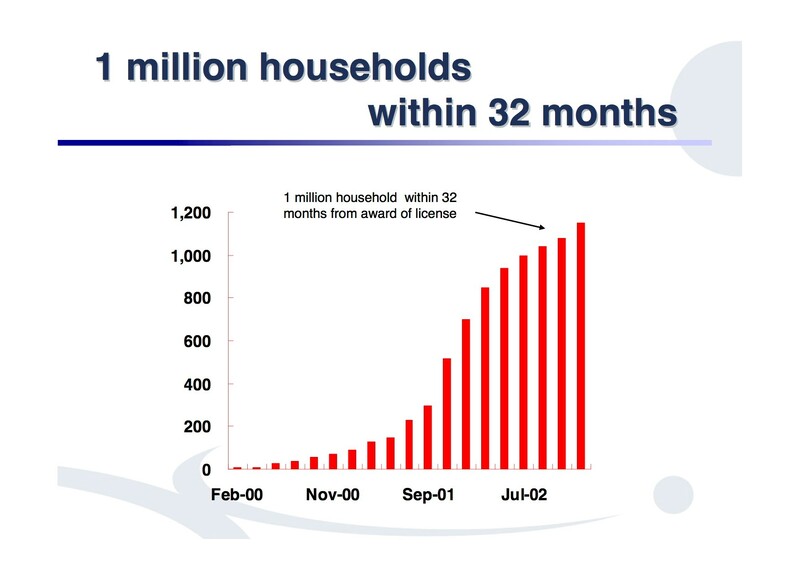 HKBN, the last competitor to enter the market against PCCW-HKT in 1999, had become the clear second largest provider of residential broadband 10 years later. After the full withdrawal of regulated ULL services, the stage was set for Hong Kong?s market to shift to competition based on full end-to end-fibre services. In October 2007, HKBN announced it would offer Fibre to the Home (FTTH) services in approximately 100 housing estates with a focus on marketing of 1Gbps services. The technology would be expanded to all residential users during 2008 (SCMP, 2007). The response from PCCW-HKT was prompted by the growing market share of HKBN and the heavy marketing campaigns that were being used to promote 100 Mbps and 1Gbps broadband services which PCCW-HKT could not deliver on its xDSL based copper network. In August 2010, Hutchison launched its residential 1Gbps service using an FTTP GPON architecture (Hutchison Telecom, 2010). Strong growth in fibre broadband services resulted in approximately 90% of Hong Kong?s broadband services being at speeds equal to or greater than 100Mbps by 2016. Furthermore, as reported by PCCW-HKT and HKBN, in 2017 approximately 80-85% of Hong Kong?s households are able to obtain an FTTH GPON service capable of 1Gbps with a choice of at least two service providers. The investment and profitability of three separate GPON FTTH networks in Hong Kong dispels the myth that fibre networks are everywhere and always natural monopolies. Natural monopolies occur where the revenues available in a market can only support the cost (capital and operating costs) of one supplier. Utilities such as electricity, gas and water networks have been typically understood to be natural monopolies. The legacy copper telephone system was also a natural monopoly until mobile and broadband technologies created competing network infrastructure and new services that increased revenues. Hong Kong demonstrates clearly that broadband residential networks can generate revenues high enough to sustain multiple suppliers with parallel infrastructure networks that compete for business. Hong Kong?s consumer broadband prices are some of the cheapest in the world, yet the revenues have supported the build and operation of multiple networks rather than being used to increase monopoly rents to shareholders. Over-regulation which retards investment in new technologies has also been avoided, providing Hong Kong with a key asset to support its social and economic well-being for the 21st century. High population density driving down unit costs of fibre network construction. Good incomes that enable consumers to afford higher value services. Open information economy that has ensured high value attributed to fast broadband services. Competitive, entrepreneurial spirit that has driven risk taking and investment. A regulator that is able to operate independently of other government departments and politics in general. All of these advantages are important. If one is missing then it is likely that competition will not deliver profitable outcomes, with monopolies and/or subsidised networks being the result. Hong Kong, with its successful, market-based city economy has significant advantages that are not available in all markets. Many cities have these characteristics in Asia, North America and Europe; however the cities are parts of larger national fixed telecommunications markets that do not universally exhibit all these advantages. Deployment of fibre-based broadband infrastructure across large national markets is undoubtedly more difficult than in Hong Kong. Some areas (eg. vibrant, densely populated cities) will exhibit the necessary characteristics for competition at the infrastructure level to be successful, other areas will be natural monopolies or uneconomic for any fibre deployment. If these national markets were considered as an aggregation of a range of sub-markets involving major cities, regional and remote areas rather than one homogenous market (which they certainly are not from an infrastructure perspective) then it may be possible to bring more competition at the network level to the major cities rather than delivering lowest-common-denominator broadband for all. The deployment of mobile networks over the last 20 years has followed this approach. New investment decisions for mobile networks were also guided by a similar range of factors as listed above. Deployments were prioritised into areas where economic returns were greatest in major cities. Competing networks successfully grew customer bases on the back of new and innovative service models that generated increasing funds for further investment into wider geographic areas. The successful rollout of competing mobile networks in most markets demonstrates the greater efficiencies and innovation stemming from competition rather than the high costs of monopoly rents and regulation that have plagued many fixed networks in their transition from basic telephony to broadband. The efficiencies that competition brings to the telecommunication infrastructure rollout in major cities, along with the extra economic output from the digital economy that results, is the best source of funding the development of telecommunications infrastructure in areas that lack the advantages of the major cities (eg. regional and rural areas). These efficiencies and extra economic output need to be taxed in ways that provide sufficient funds to support the rollout of infrastructure in areas where these key advantages are lacking. In locations where competition does not drive investment, government has a role to regulate monopolies and fund infrastructure development (both fixed and mobile) where it is uneconomic otherwise. Hong Kong also has valuable lessons in this regard as even this city economy has remoter villages and islands that have not benefited from the competition to rollout fibre based networks. Hong Kong?s fibre coverage is not universal. Approximately 10 to 15% of the region does not have access to fibre networks from any operators. While both HKBN and PCCW-HKT are continuing to build fibre networks into various local villages and remote areas in Hong Kong (HKBN, 2015), there is a limit to the financial returns available so that this is unlikely to achieve 100% universal fibre coverage. As mentioned above, the regulator decided to implement a sunset date of 30 June 2008for all regulated ULL services across the entire Hong Kong market. This was done in order to ensure that all buildings where alternative customer access networks were ?technically feasible and economically viable? would see infrastructure investment. A hard cutoff date was needed to ?reinforce the above arrangements with greater clarity and certainty? (Hong Kong Legislative Council, 2004). After the sunset date, buildings that were not technically feasible and not economically viable would fall back to being supplied on terms determined by PCCW-HKT. Furthermore, there would be no incentive for PCCW-HKT to rollout fibre infrastructure to these buildings given the high costs and the lack of competition. As a result these areas would be left to be serviced primarily by ADSL or wireless broadband technologies. This has resulted in households in areas without competition complaining about being left behind the vast majority of Hong Kong when it comes to broadband services (SCMP, 2015a; 2015b; 2015c). Some households have banded together and paid the substantial sums required by PCCW-HKT to bring fibre infrastructure to particular areas. However, this is clearly restricted to those areas where the households are relatively well-off in economic terms. The regulator decided to leave any future competition issues with these non-economical buildings to be covered by an ?essential facilities? criterion using ?established competition law principles? (Hong Kong Legislative Council, 2004) established in the USA during the 1980s (OECD, 1996). It is difficult to see how reliance on this ex-post type of regulation will assist households in these areas. The small market size means the incentive for competitors to PCCW-HKT to initiate a competition case are extremely low. The regulator may have the power to initiate such action but is unlikely to without support of competitors to PCCW-HKT. As a result it is likely the situation for many of these areas will remain unchanged unless the Hong Kong government intervenes with an appropriately funded broadband universal service policy that drives fibre investment. A universal service obligation does exist for basic fixed telephony services and public payphones; however the regulator has not indicated any plans to extend this to broadband or mobile services (OFCA, 2017). Hong Kong?s successful transition from a regulated incumbent-run monopoly telephony market before 1995 to a vibrant, competitive fibre-based broadband market within 20 years is a model for many cities. The factors that contributed to this success are not necessarily unique to Hong Kong. Hong Kong has also shown that success in fibre broadband in densely populated areas does not automatically translate to regional and rural areas. In fact it has shown that without government support these areas are left behind with a monopoly that will not invest due to a lack of return on investment. Hong Kong is an example of what does work and what doesn?t work in ensuring broadband infrastructure is upgraded for the benefit of social and economic development. The lessons learned can be used by many other markets to find better ways to a brighter broadband future.